Knife Rights has donated Freedom's Steel™ IV - The Jefferson Bowie, an extraordinary custom knife collaboration,to the National Rifle Association's Institute for Legislative Action (NRA-ILA) in appreciation for their support of Knife Rights' legislative efforts in fighting the Second Front in Defense of the Second Amendment™. Freedom's Steel™ IV was conceived of, and sponsored by, Knife Rights expressly to benefit NRA-ILA. This is the fourth year in a row that Knife Rights has donated a Freedom's Steel™ knife, raising $66,500 the first three years. "Knife Rights and the NRA have a common interest in protecting our civil rights and specifically the right to own and use tools appropriate for self-defense. At a time when our Second Amendments rights are under unprecedented assault, we are proud to assist NRA in protecting these rights." said Knife Rights Chairman and Founder Doug Ritter. "We are sincerely grateful for the support provided to us by NRA-ILA as we fight the Second Front in Defense of the Second Amendment." 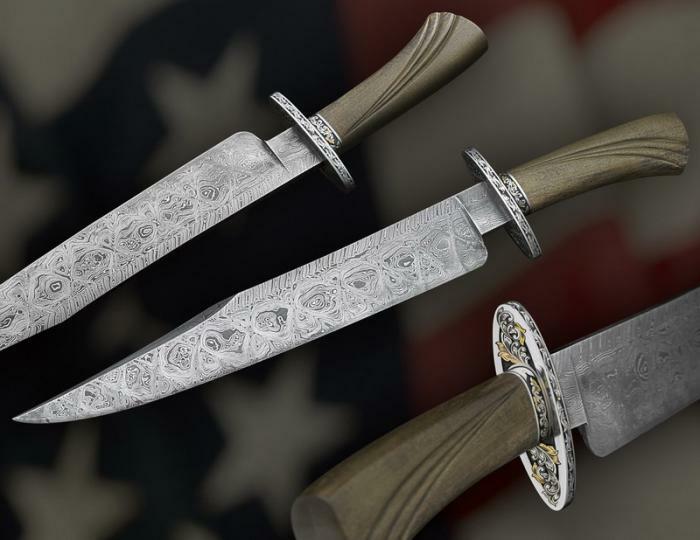 Ritter noted, "we are indebted to these incredibly talented artisans and companies who contribute their valuable time, talents and materials to support Knife Rights by creating this extraordinary knife." Each craftsman's efforts and every component of Freedom's Steel™ III was donated to Knife Rights to support its efforts to defend and enhance our right to own and carry knives as tools used daily by millions of Americans and at times wielded as an "arm" in self-defense. The body of the blade has 239 layers, one for each year from 1776 to 2015. The pattern in the body the blade has 21 Xs forged into the steel to formally salute our Constitution and the Second Amendment. The dramatic on-of-a-kind 12.75-inch Damascus blade of Freedom's Steel™ IV - The Jefferson Bowie was forged by National Living Treasure and American Bladesmith Society Master Bladesmith Jerry Fisk with two distinct patterns to honor our Second Amendment. The pattern on the spine of the blade was first forged with 13 layers of high carbon steel, one layer for each of the original colonies. Fisk then folded that 13-layer billet to 39 layers, the number of the signers of the Constitution. He then twisted the bar to the right (of course) honoring the rights accorded to all Americans that are incorporated into the Bill of Rights. The histroic wood handle of Freedom's Steel™ IV - The Jefferson Bowie is made from the wood of the "Jefferson Tulip Poplar" tree. This is from the only tree with provenance as being personally planted by Thomas Jefferson at Monticello. Fisk carved three flutes into the handle to honor Jefferson as our third President, a framer of the Constitution who was a major force and inspiration for the Bill of Rights that includes the Second Amendment. This historic tree was felled and salvaged by Historical Woods of America in 2008. The beautiful poplar wood is stabilized to last for generations. The full guard and ferrule of Freedom's Steel™ IV - The Jefferson Bowie has been deeply engraved by Master Engraver Jim Small with scrollwork and leaves representing the birth and renewal of the nation. Small added 24K gold inlays to highlight the exquisite engraving. Freedom's Steel™ IVis presented in a custom-built black walnut display case by Brookfield Case. It features glass on four sides and the top and a document storage drawer.